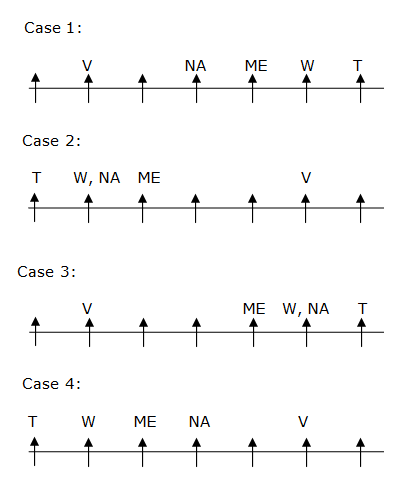 Dear Readers, Bank Exam Race for the Year 2018 is already started, To enrich your preparation here we have providing new series of Practice Questions on Reasoning Ability – Seating Arrangement.Candidates those who are preparing for IBPS RRB Assistant Mains 2018 Exams can practice these questions daily and make your preparation effective. 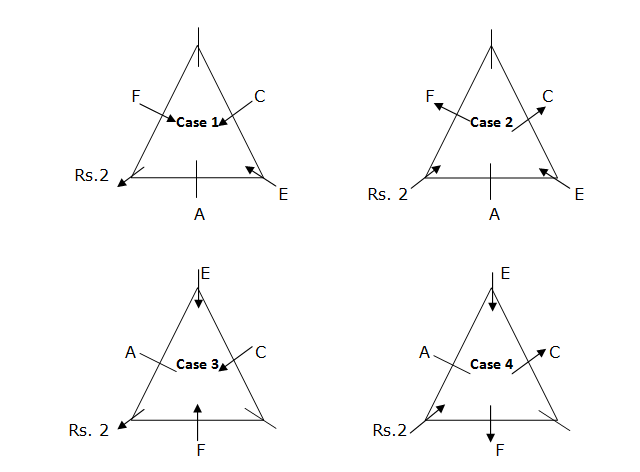 Six persons-A, B, C, D, E and F are sitting in a equated triangular table. Three of them sit at the corner of the table and three of them are sits at the middle of the side. Some of them facing center and some of them are facing outward of the table. Each of them likes different amount of coins, viz. Rs.1, Rs.2, Rs.5, Rs.10, Rs.50 and Rs.100, but not necessarily in the same order. A is an immediate neighbour of E. The one who likes Rs.2 sits at the one of the corner of the table. Only oneperson sits between C and F and both are facing same directions.E and B are facing opposite directions. Only two persons sit between the one who likes Rs.1 and the one who likes Rs.5 and both are facing same directions. Product of the coin rate of A and F is equal to the E’s coin rate. E sits third to the right of F. F’s coin rate is five times of D’s coin rate. E’s coin rate is ten times of A’s coin rate. The one who likes Rs.1 facing opposite direction of the one who likes Rs.100. The one who likes Rs.5 sits immediate left of the D.C sits third to the left of the one who likes Rs.2 and both are facing opposite directions. E faces center. Who among the following likes Rs.1? The one who likes Rs.2 sits at the one of the corner of the table. C sits third to the left of the one who likes Rs.2 and both are facing opposite directions. Only one person sits between C and F and both are facing same directions. E sits third to the right of F.
A is an immediate neighbour of E.
Product of the coin rate of A and F is equal to the E’s coin rate. F’s coin rate is five times of D’s coin rate. E’s coin rate is ten times of A’s coin rate. The one who likes Rs.5 sits immediate left of the D.
If D=Rs.1 means F is Rs.5. If D=Rs.10 means F is Rs 50. 1*5=5, its not satisfied because If A=Rs.1 means E is Rs.10. 1*10=10, its satisfied all the conditions. 5*10=50, its also satisfied all the conditions. From the above conditions A’s rate is either Rs.5 or Rs.1. And F is rate is Rs.10 and D is rate is Rs.2. 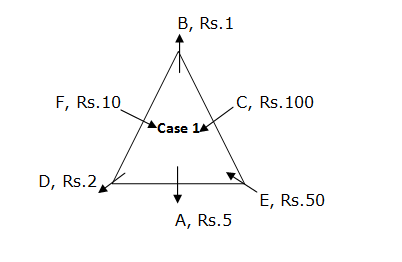 The one who likes Rs.5 sits immediate left of the D, Hence A is rate is Rs.5. From the above condition Case 2 and Case 3 was dropped. If A is Rs.5 means E is Rs. 50. E and B are facing opposite directions. The one who likes Rs.1 facing opposite direction of the one who likes Rs.100. Only two persons sit between the one who likes Rs.1 and the one who likes Rs.5 and both are facing same directions. From the above condition Case 4 was dropped. What is the position the one who likes Rs.10 with respect D? How many persons are facing outward of the table? 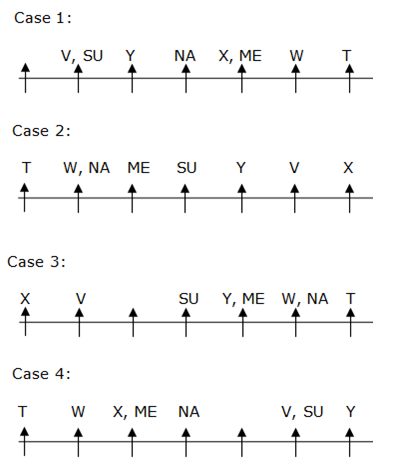 Seven friends-S, T, U, V, W, X and Y are sitting in a straight line facing north. Each of them likes different lakes, OS, HI, GZ, ME, DE, SU and NA, but not necessarily in the same order. Only three persons sit between W and V. Only one person sits between the one who likes ME and T. Only one person sits between the one who likes NA and the one who likes SU. The one who likes ME is an immediate neighbour of the one who likes NA. Only two persons sit between U and the one who likes HI. Only two persons sit between X and the one who likes SU. The one who likes GZ sits third to the right of the one who likes DE. HI sits one of the rights of U. Y sits to the immediate right of the one who likes SU. U does not like ME. T sits one of the ends of the line. S likes OS. Only two persons sit between V and the one who likes ME. W does not like SU. How many persons sit between the one who likes SU and the one who likes GZ? Only three persons sit between W and V.
T sits one of the ends of the line. Only one person sits between the one who likes ME and T.
Only two persons sit between V and the one who likes ME. The one who likes ME is an immediate neighbour of the one who likes NA. Only one person sits between the one who likes NA and the one who likes SU. W does not like SU. Y sits to the immediate right of the one who likes SU. Only two persons sit between X and the one who likes SU. Only two persons sit between U and the one who likes HI. HI sits one of the rights of U.
U does not like ME. The one who likes GZ sits third to the right of the one who likes DE. From the above condition Case 2, Case 3 and Case 4 was dropped. What is the position of S with respect to the one who likes DE? Who among the following likes GZ? 1) Who among the following likes Rs.1? 2) Which of the following combinations is correct? 3) What is the position the one who likes Rs.10 with respect D? 4) How many persons are facing outward of the table? a) A likes Rs.5 and sits immediate right of E.
d) Only one persons sit between E and A. 6) How many persons sit between the one who likes SU and the one who likes GZ? 7) Which of the following combinations is correct? 9) What is the position of S with respect to the one who likes DE? 10) Who among the following likes GZ?